I had fun painting this one. Loved painting the flowers. 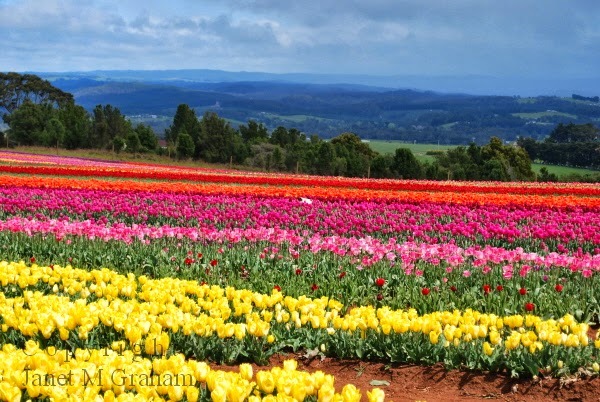 I actually want to paint the tulip fields I saw in Tasmania - just haven't quite worked out how to paint them yet. I have a few ideas so something will eventually just click. 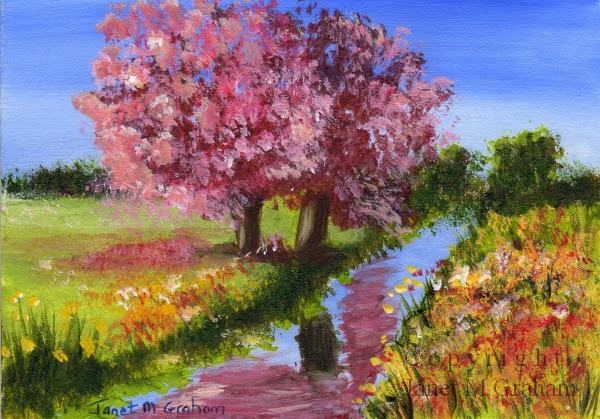 Spring measures 3.5 x 2.5 inches and is painted on 300gsm smooth Arches watercolour paper. This is the other painting that I never got around to painting before my holiday. I used the same background colours as the Spotted Pardalote which I think works really well. The average size of a Striated Pardalote 9 cm and weigh around 11 grams. 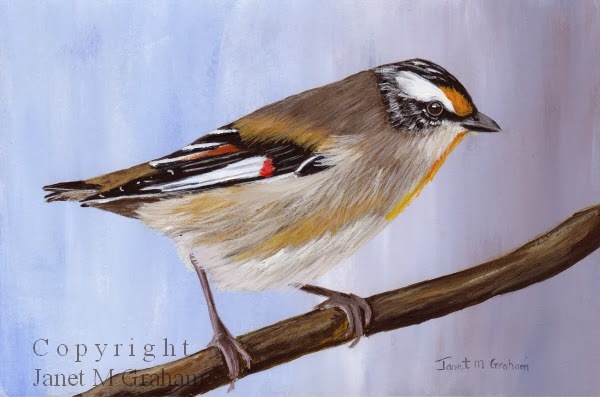 Striated Pardalote measures 6 x 4 inches and is painted on 300gsm smooth Arches watercolour paper. I couldn't wait to paint the Pink Robin I saw at Liffey Falls so here he is. They are not found in Queensland - they are only found in south-eastern Australia and are listed as Vulnerable in New South Wales. They are a lovely little bird - I was really lucky to have come back to the car park just when he was admiring himself in the car's side mirror otherwise I wouldn't have got any reference photos. They move too quickly in the forest. 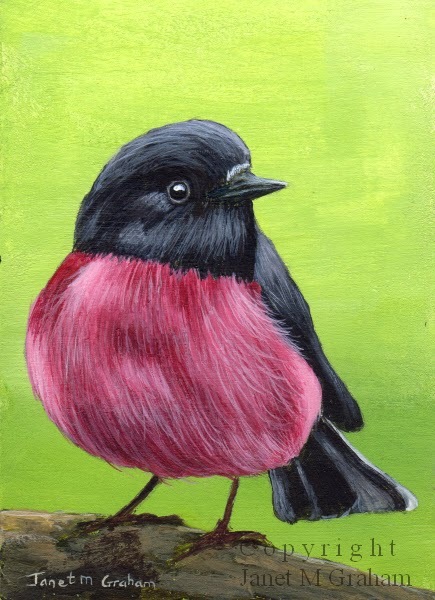 Pink Robin measures 2.5 x 3.5 inches and is painted on 300gsm smooth Arches watercolour paper. I saw quite a few of these birds in Tasmania - they were introduced to Australia in the19th century. I wasn't able to get any good shots of them around the accommodation I was staying at but I did visit a zoo in Richmond and they had an aviary with different finches and one of them was the Goldfinch. Managed to take a few good photos so I am planning on painting another one but it will be in a larger format with a more detailed flower background. This was the last painting I painted before going on holiday - needed a break from the details of the birds. Rather pleased how it turned out. Looking forward to painting again - need to go through my photos from my holiday and print some out that I can use as references. The view from the Deloraine accommodation was lovely - overlooked farmland and a lake so will have to paint that scene. Also, managed to get a good reference photo of the Richmond Bridge which I am already thinking about painting plus I can't wait to paint my Pink Robin and fairy wren. 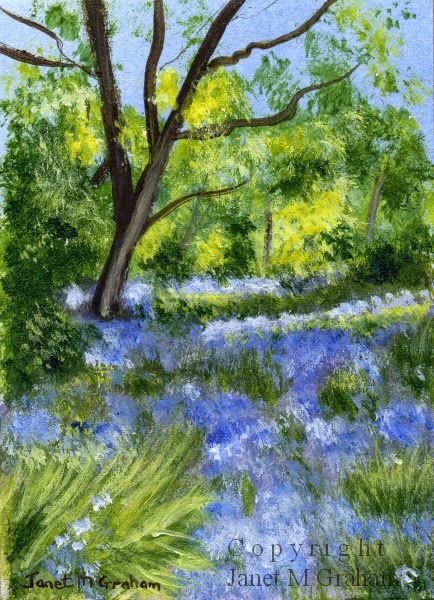 Bluebells measures 2.5 x 3.5 inches and is painted on 300gsm smooth Arches watercolour paper. Many thanks to Terri for the reference photo. I loved painting this one - it just all seemed to come together. Really like my background colour too. 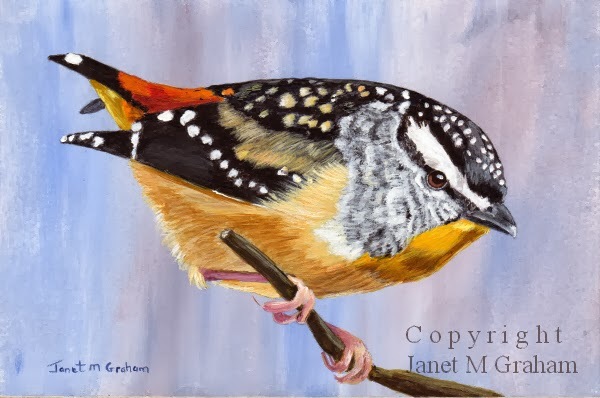 I am also going to be painting a 6 x 4 inch Striated Pardalote with a similar background colour - just ran out of time to paint it before going on holiday so will paint it in the next few days. Spotted Pardalote measures 6 x 4 inches and is painted on 300gsm smooth Arches Watercolour paper. I love the colouring of this bird. They are found in much Europe, across Asia to Siberia and also in northwest Africa. They grow to about 14.5 cm in length and are part of the finch family. 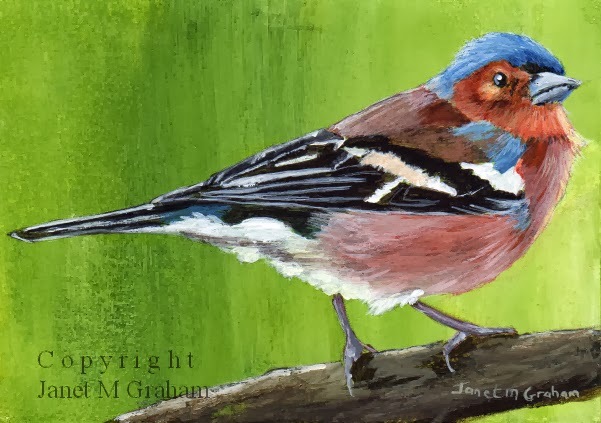 Chaffinch measures 3.5 x 2.5 inches and is painted on 300gsm smooth Arches watercolour paper. 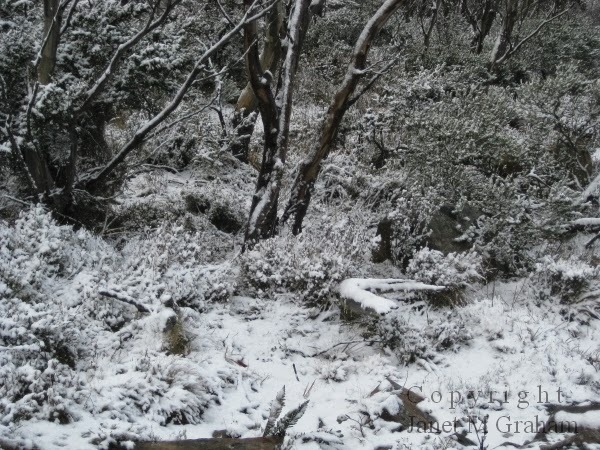 I have been on holiday to Tasmania for 10 days and had a lovely holiday. Saw the most spectacular tulips at Wynyard. 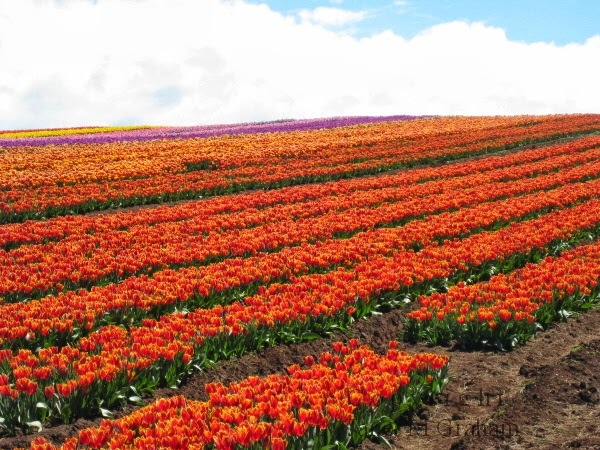 It is the first time that they have opened up the whole farm to visitors (http://www.vdqbulbs.com.au) - normally they grow just one field of tulips for visitors. There were just rows and rows and rows of tulips - quite breathtaking - spent about 2 hours wondering the 20 acres. 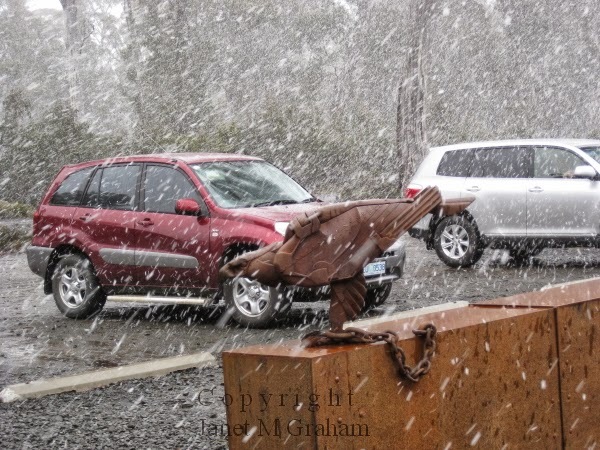 You can experience all seasons in Tasmania as on the drive through to Derwent Bridge to see the Wall of Wilderness (http://www.thewalltasmania.com), I actually drove through snow and it actually started to snow!!! It was a bit of a surreal experience and a highlight of the trip. Another highlight was seeing the Pink Robin as Liffey Falls - I saw one walking along the path to the falls, but couldn't get any good photos of it. But when I got back to the car, there was one sitting on the mirror of another car and I managed to take quite a few shots. Also a Superb Fairy Wren was fascinated by its reflections so also managed to get some good reference photos of it too. 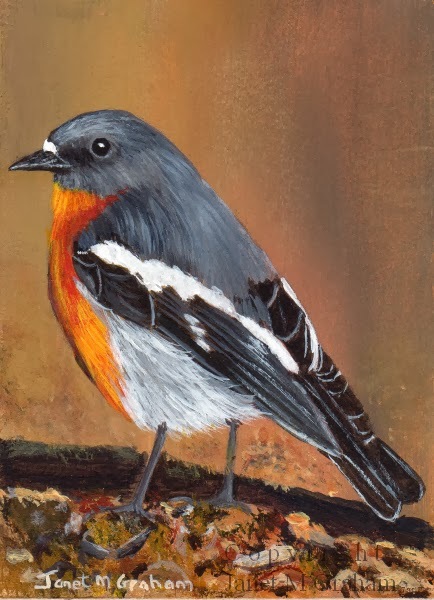 So there will be a few paintings of pink robins and fairy wrens coming. 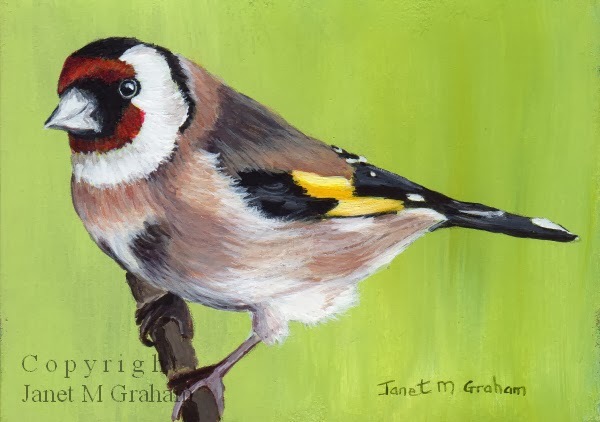 I painted this one before I went away on holiday and love how it turned out - very nearly ended up in the bin as I just couldn't get it to come together - I am blaming it on the fact I decided to try something different and paint the beak first - think I will stick to painting the eyes first and leaving the beak until last. I needed a break from painting detail so decided to paint this little seascape scene. I added the birds as I thought it added a bit of interest. It was fun painting a little seascape for a change so will have to look for some more reference photos. I will have to look into buying a miniature fan brush as it would make painting the palm trees a lot easier. 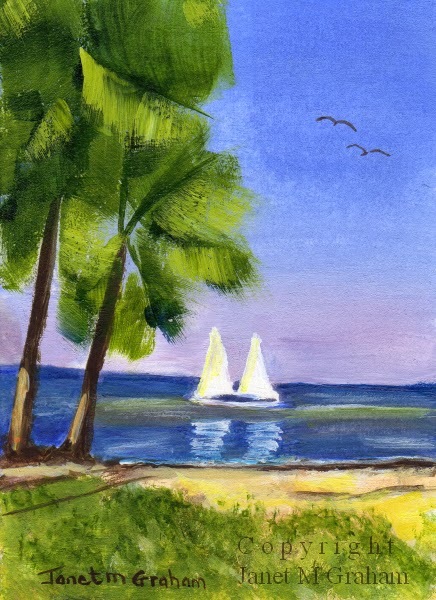 Tropical Beach measures 2.5 x 3.5 inches and is painted on 300gsm smooth Arches watercolour paper. Many thanks to Barbara Norton for the reference photo. I had fun painting this one. It was a bit tricky painting the windows and adding a bit a depth to the cottage. I decided that the cottage wouldn't be complete without flowers so I added them and I am rather pleased how the painting turn out. 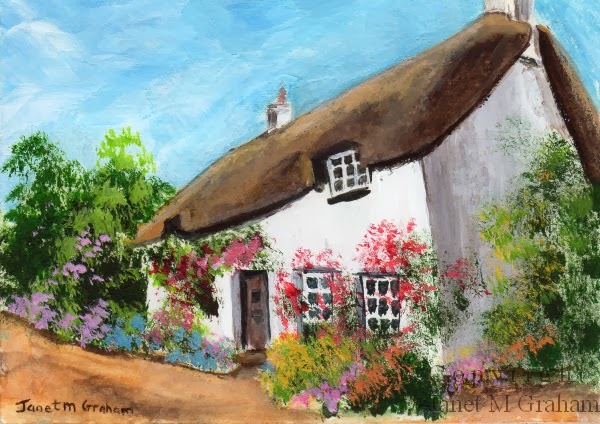 Thatch Cottage measures 3.5 x 2.5 inches and is painted on 300gsm smooth Arches watercolour paper. Many thanks to Philip Gale for the reference photo. 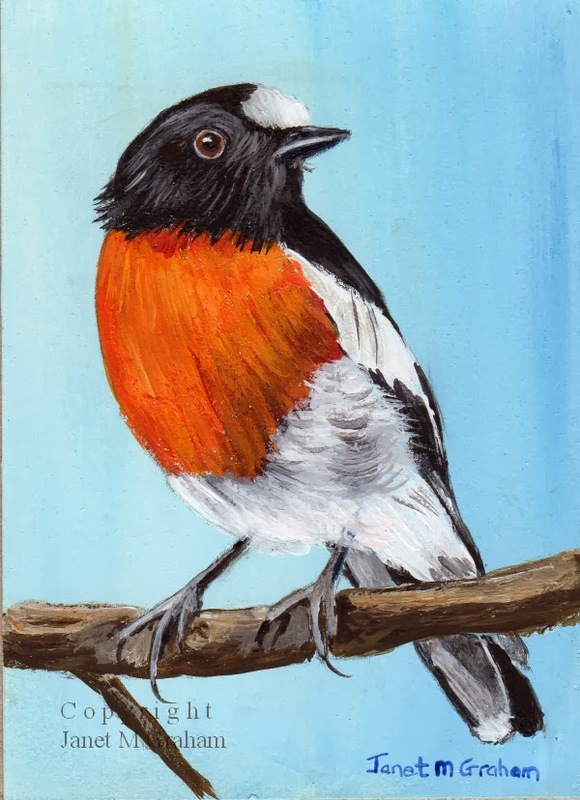 I decided to paint another Scarlet Robin as I do enjoy painting them - love their vibrant red feathers. I will have to look for another reference photo as I would like to paint another one but in oils and in a larger format. 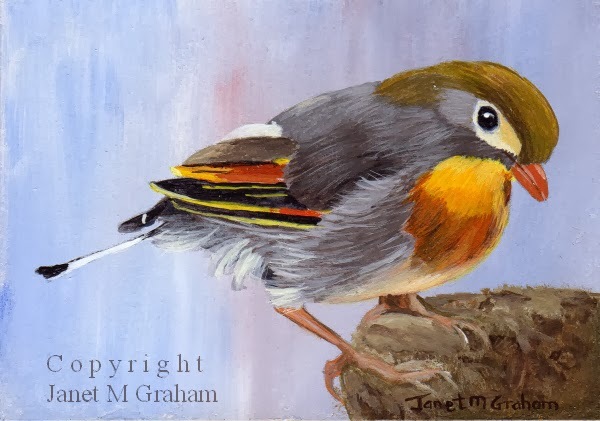 Pekin Robin measures 3.5 x 2.5 inches and is painted on 300gsm smooth Arches watercolour paper. Many thanks to Clare Smith for the reference photo. I just love all the different coloured feathers this bird has. These birds can be found in sub Saharan Africa and the southern Arabian Peninsula. It is the national bird of Botswana and Kenya. I will have to have a look for another reference photo is it would be interesting to paint a larger oil version. 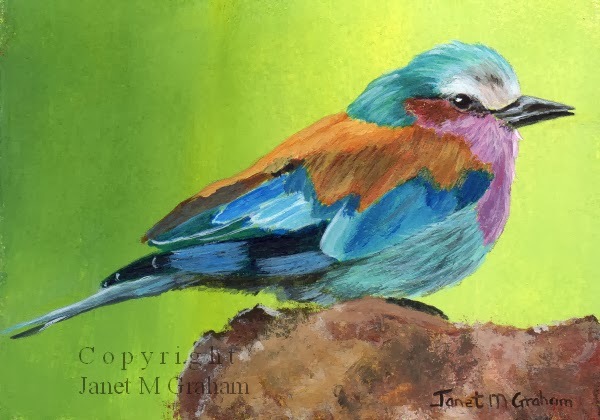 Lilac Breasted Roller measures 3.5 x 2.5 inches and is painted on 300gms smooth Arches watercolour paper. I decided to paint this one in acrylics mainly because I wanted to paint it in one sitting. If I had painted in oils, I would have had to wait for the layers to dry to add the finer details. The Mallee Emu Wren can be found in north western Victoria and south eastern South Australia and are listed as endangered species. They are about 16.5 cm in length from head to tail. 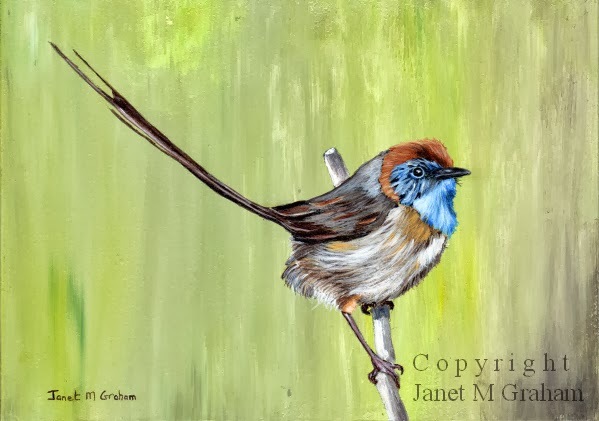 Mallee Emu Wren measures 7 x 5 inches and is painted on Ampersand Gessobord panel. I just love the way these birds cling to trees. They make for interesting paintings. This one is a Red Breasted Nuthatch and is found across western northern temperate North America and winters much across the US and southern Canada. 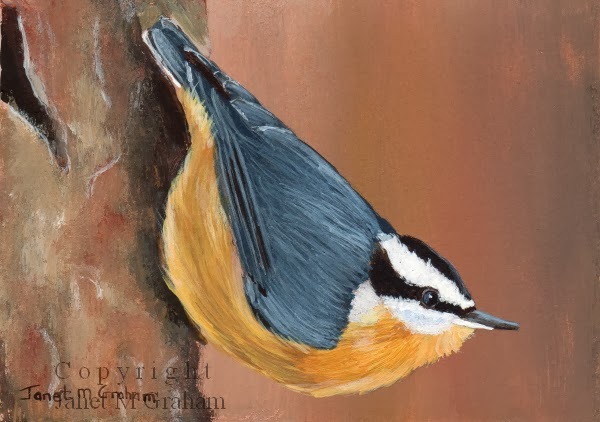 Nuthatch measures 3.5 x 2.5 inches and is painted on 300gsm smooth Arches watercolour paper. I couldn't resist painting this one. Just love the position the bird is sitting on the branch. These birds are found throughout southern Australia from Brisbane to just North of Perth. It is about 18 cm in length. 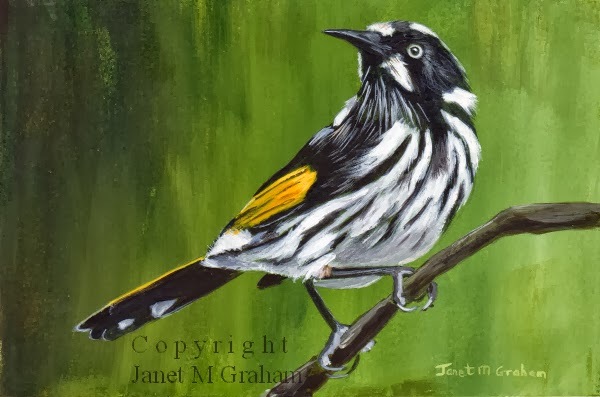 New Holland Honeyeater measures 6 x 4 inches and is painted on 300gsm smooth Arches watercolour paper. I can't resist painting this cute little bird. I decided to use a canvas board for a change as I like the 6 x 4 inch size and can't get this size in the Ampersand Gessobord panel. Rather pleased how it turned out. Think I will paint another Laughing Kookaburra on the other 6 x 4 board that I bought. 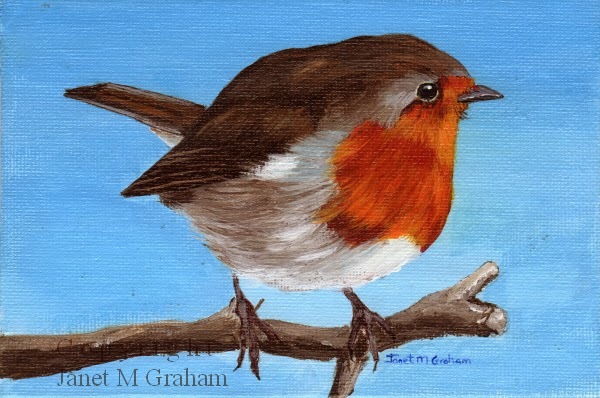 Little Robin measures 6 x 4 inches and is painted on canvas board. I have had this one printed out for ages to paint. Just had to decide on what medium to use. Finally decided to paint it in acrylics on paper. Started it off a bit like a watercolour painting with washes and then kept adding layers. I am rather pleased how it turned out. 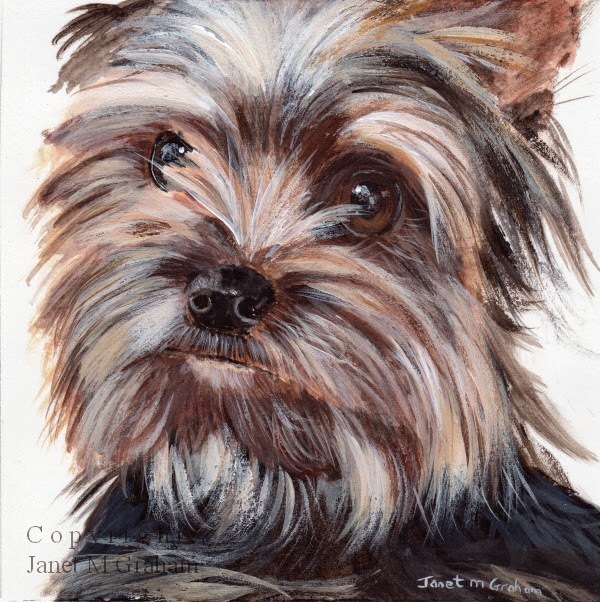 Yorkie measures 5 x 5 inches and is painted on 300gsm smooth Arches watercolour paper. Many thanks to Lorri Speiran for the reference photo.